The ignition coil is truly an amazing little device. An ignition coil is a type of pulse transformer that multiplies the low voltage received from the battery or alternator to many thousands of volts when the breaker points open and close. The coil contains a primary winding, a slot iron core, and a secondary winding. The high voltage output of the coil is directed to the appropriate spark plug by the distributor. Hence, without this high voltage, there is no spark and, consequently, internal combustion cannot take place within the engine. Simply put, the bottom line is without spark the engine doesn't run. So that's why when my 1963 Corvette kept cranking but wouldn't start, after making sure there was fuel entering the engine, the next thing to check was that there was spark to ignite the fuel. The coils on early Corvettes are black cylindrical devices; starting in 1975 the coil per se as a discrete cylindrical device was abandoned when GM made the switch to HEI breakerless ignition systems. The information I'm providing here, however, applies to all GM vehicles of the period and broadly applies to virtually any 12-volt vehicle with a discrete ignition coil. Checking for spark is pretty easy to do. You simply pull a spark plug from the engine (or use a spare plug if you have one in your parts box, snap one of the plug wires onto it and make sure the shank of the plug is grounded against the engine block (do not hold onto the spark plug with your bare hands unless you want to get a really nasty jolt — spark plug boot pulling pliers or other insulated-handle pliers are a good thing to use for this purpose). 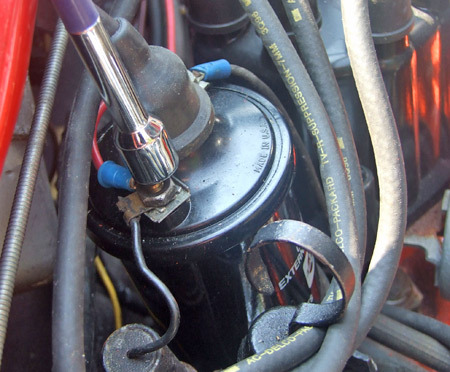 Have someone crank the engine and observe the center electrode of the plug — if there's sufficient voltage reaching the plug, you should see a bright blue spark jump across the gap of the electrode every time that cylinder fires. If you see no spark, the coil is a good thing to suspect next. 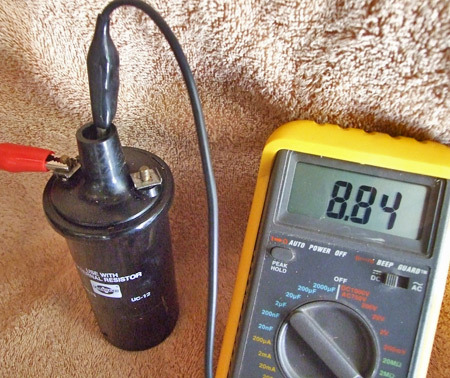 You'll need a digital multimeter to check the resistance levels of your coil. The side terminals of the coil are marked positive (+) and negative (–) and these are where you can measure the resistance of the primary windings. 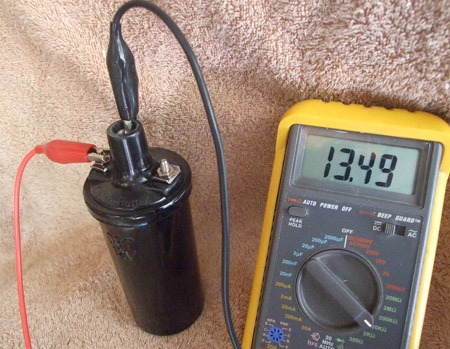 Set the multimeter to the 200-ohm setting and attach the meter's leads corresponding to the terminal markings, red being positive and black being negative. The normal primary reading for 12V (1956 and later) Corvettes on the primary side is 1.6, although a range of 1.5 to 1.7 is acceptable. Next, you'll want to measure the resistance of the secondary coil, and this is the real business-end of the spark-producer. Switch the meter's resistance range to the 20K-ohm setting and attach the negative (black) meter lead to the center terminal of the coil. The reading here should be 11.00 or better, with 13.49 being about normal. If your coil reads under 11.00, then chances are pretty good that this is the reason you're not getting any spark or a very weak one. Replace the coil with a good quality new one, make sure you attach and tighten the leads correctly, plug in the top cable that goes to the distributor, turn the key and you should be good to go! Use a nut driver or a small wrench to loosen the securing nuts on the coil terminals and remove the leads; the positive side of the coil has a condenser lead attached in addition to a positive lead. Then loosen the bottom clamp screw, pull out the center cable that goes to the distributor and remove the coil. 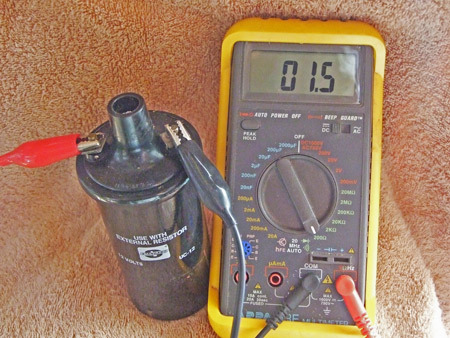 Alternatively, you can check the coil right in the car with your multimeter if you remove all three leads first. This is the aftermarket coil that was in my Corvette. Normal reading on the primary windings is 1.6, but 1.5 is still within the acceptable range, so this by itself doesn't necessarily indicate a problem. 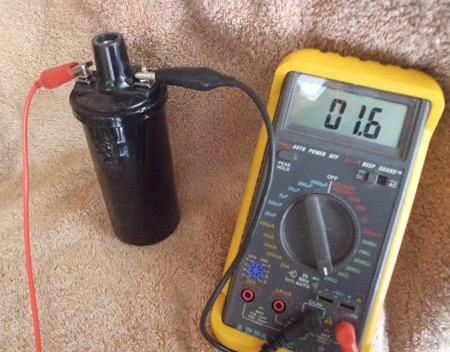 This reading of 8.84 does indicate that the coil's secondary windings are not putting out as much voltage as they should; the minimum acceptable resistance reading here should be 11.00, with approximately 13.5 being normal. Here's the primary reading on the new replacement GM Delco coil before I installed it. The 1.6 reading is exactly what it should be but, again, the real telling is what the secondary resistance reading is. Ah, yes — 13.49 is more like it. Now there should be plenty of fire in the hole! All that remains is to install it in the car, connect the leads to the terminals, plug in the distributor cable and start her up!